Finals (8/29) - Stanford junior All-American David Chung lost in the 36-hole finals of the 110th US Amateur to Oklahoma State junior Peter Uihlein. David displayed fantastic shot-making and creativity throughout the championship but came up short in the finals against the solid all-around play of Uihlein who drove it well and putted solidly. Stanford fans can be proud of David's play but also his positive, spirited demeanor and sportsmanship throughout the event. No doubt David's brilliant talent will take him far in golf as he earns berths in next year's Masters, US Open and a spot on the 3-man US team in the World Amateur Championships in Argentina in October where he will be pared with Uihlein and his semi-final opponent Scott Langley. Here's the runner-up interview, and another championship article about David. 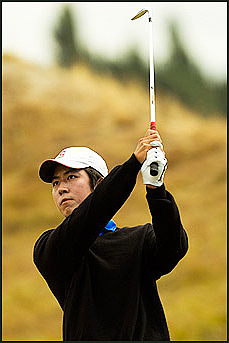 USGA's Amateur website. "We are so excited about David's play this summer," Head Men's Golf Coach Conrad Ray said. 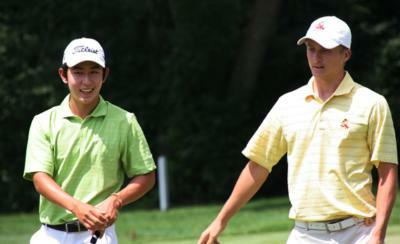 "Reaching the finals of the US Amateur was a great end to one of the best summers of amateur golf I've seen. David's wins at the Porter Cup, the Western, and now, the finals of the US Am has been so exciting." Chung's success, according to Ray, can be attributed to his strength and creativity. 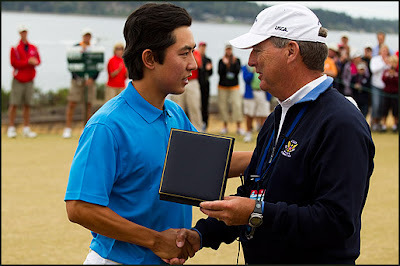 "A course like Chambers Bay matches up so well with his shot-making ability," Ray said, citing "Chung’s flop shot," the now famous par save during Chung’s Semi-final match, as well as the 118 yard pitching wedge shot that Chung holed on the 26th hole (hole #8) to save par during today's round. "I was proud to see him mature this summer. His mental approach has become a strength, allowing for him to be a steady competitor." The par five 24th hole was one to remember. David pulled his drive deep into the dense fescue grass and was twice only able to move it a few feet with a 5-iron. Still deep in fescue, he wedged out to 112 yards. From there he said later he had a feeling about the shot and proceeded to send it past the pin into the slope where it rolled back straight into the hole for a dramatic par 5. 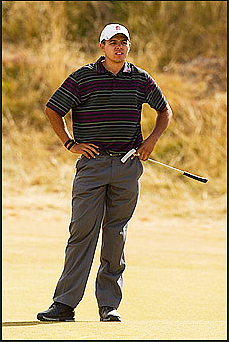 Meanwhile, Uihlein was waiting to hit his 3rd shot from about 60 yards --- a lesser opponent would have become unnerved by David hole out but the champion calmly put his wedge shot within 8 feet and drained the birdie putt to extend his lead to 3 up and two holes later the lead went to 4 up. 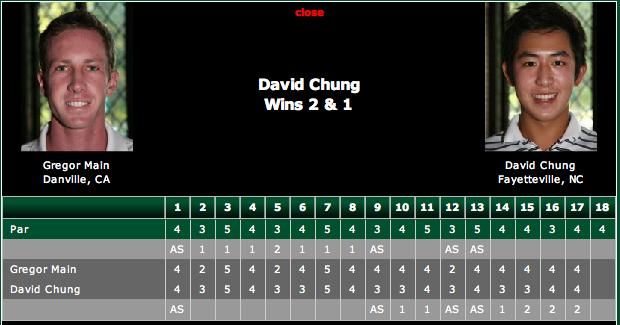 That lead proved to be enough in the end despite David's cutting the lead to 2 up after 29 holes. David's crucial 7-foot eagle putt on the 30th hole slid by and his birdie was then matched by Uihlein's birdie putt from 5 feet. A long birdie putt by Uihlein on the 32nd hole meant he was 3 up with 4 to go. 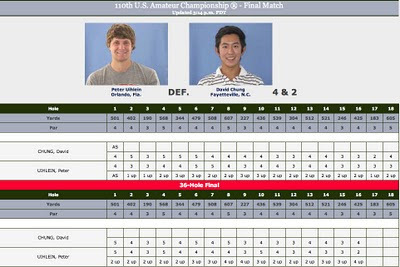 Semi-finals Match Play (8/28) - David Chung moves into the 36-hole finals of the US Amateur with a brilliant 1 up win over defending champion Beyong-Hun An, an incoming freshman at Cal. The win guarantees David a spot in next year's Masters and US Open. David was 4-under par after 6 holes but found himself 3 down as An started 6-under over that same stretch. A birdie on #7 cut the deficit to 2 down but after 9 holes, David was 3-down. 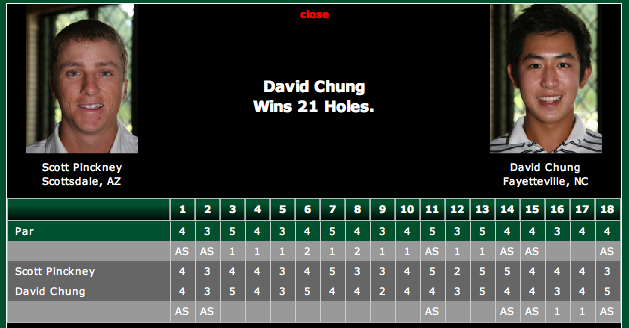 Solid play on the back nine featuring a crucial par-saving putt on 13 and a brilliant flop-shot on 14 to again save par moved David 1 up after 16 holes. An drained a clutch 8-footer for par on 17 to square the match headed to hole 18. After both hit solid drives, An pushed his 2nd into a bunker while David hit his long iron onto the left side of the green some 45 feet away. An's bunker lie was very difficult and he blasted long more than 50 feet away and faced a very tough uphill/sidehill putt. An's first putt drifted hard right to 15 feet while David's long putt was beautifully rolled to within 2.5 feet. After An's putt was missed, David's winning putt was conceded. In the 36-hole finals David will face top-ranked amateur Peter Uihlein, a junior at Oklahoma State. The match will be televised on NBC starting at 1 pm Pacific time. Quarter-finals Match Play (8/27) - David Chung advances to the semi-finals of the 110th US Amateur after his 1-up win over NCAA champion Scott Langley. With David holding a 2-up lead going into 17, Langley birdied to force a final hole. After David laid up on the par 5 18th, Langley reached the green in two. From a tough, downhill lie, David wedged it to about 12 feet while Langley ran his long birdie putt about 9 feet past. The match ended when David made his clutch birdie putt. The hole-by-hole scorecard is below. Interview with David after the round. Next up is a match with defending champion, Byeong-Hun An of Korea, who will be a freshman at Cal this year. The winners of semi-final matches is guaranteed a spot in the Masters next Spring. A total of 6 Stanford golfers competed in the world's premier amateur event, the 110th US Amateur, first played in 1895, held at Chambers Bay GC in Tacoma, Washington. Among the 6 Stanford players were 4 current team members, David Chung, Sihwan Kim, Steve Ziegler and incoming frosh Cameron Wilson. In addition, recent grad Joseph Bramlett ('10) and '03 grad George Downing are competing. Match Play (8/26) - Junior All-American David Chung moved into the quarterfinals to face NCAA champion Scott Langley after two wins yesterday while Joseph Bramlett lost a heartbreaker in the round of 16. David won 4 & 3 in the round of 32 and 2 & 1 in the round of 16 beating '09 US Publinx Champion Brad Benjamin. With many holes of the round of 16 televised the players battled high winds as David made several difficult up and downs to keep his slim lead. A solid par 4 on the tough 17th closed out the match. In the post match interview David said the turning point was his winning par on hole #7. See the details below by clicking on the scorecards. 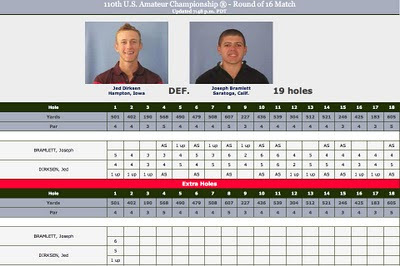 Joseph won his round of 32 match 4 & 3 over Tyler Sheppard but lost the afternoon round of 16 match 1 down on the 19th hole to Jed Dirksen. Joseph won the 18th hole in both matches with birdies but bogied the par 5 first hole in the playoff to lose his last match. Match Play (8/25) - Joseph Bramlett wins his match 4 & 3 while David Chung also wins 3 & 2 as both advance to the round of 32. 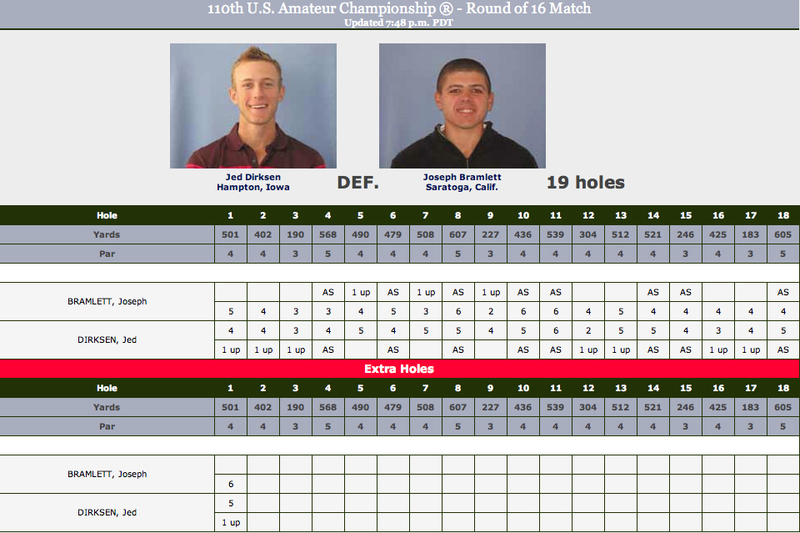 Both played their rounds well under par --- click on the scoring below to enlarge. 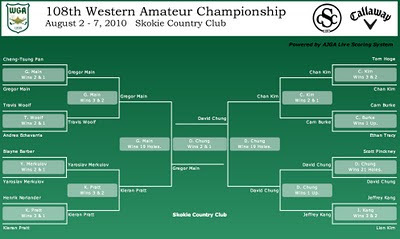 The match play bracket gives the players, tee times and of course results. Two Stanford golfers remain from the 6 who had qualified for the US Amateur. David Chung plays Mike McCoy from Iowa at 9:10 am while Joseph Bramlett plays Mike Miller of Brewster, NY at 11:40. Round 2 (8/24) - There are two Stanford golfers moving into match play as one of the low 64 players remaining after the 2nd round of stroke play. 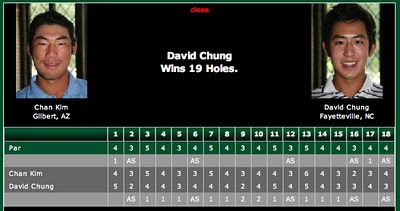 Joseph Bramlett ('10) with 72-71 tied for 7th and David Chung 75-69 tied for 13th as both easily move on to match play. Steve Ziegler with 78-73 tied for 94th, Sihwan Kim with 76-80 toed for 180th, Cameron Wilson with 72-87 tied for 233rd and George Downing ('03) with 85-75 tied for 247th. Round 1 (8/23) - There is work to be done after round 1 for players to move on to match play. Wilson leads at even par (T24) followed by Bramlett at +1 (T41), Chung and Kim at +4 (T123), Ziegler at +7 (T188) and Downing at +7 after 9 holes. Only the low 64 players after round 2 will continue into match play. Chung qualified and has had a superb summer with wins at the prestigious Western Amateur and Porter Cup after competing for the US in the Palmer Cup vs Europe at Royal Port Rush GC in Northern Ireland. Kim and Wilson qualified as well and have also enjoyed solid summer results. Ziegler was exempt based on his quarter-final result in 2009 and Bramlett was exempt after qualifying for the US Open this year. Downing also qualified. The format for the event is two rounds of medal play where the low 64 are determined, followed by match play. 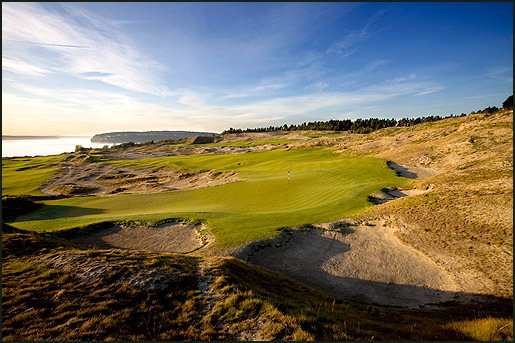 The huge field of 312 players are split playing on two courses, the primary host course of Chambers Bay and a second course, the PNGA Home Course nearby. All match play rounds will be played at Chambers Bay. The official US Amateur website provides complete scoring, stories and photos of both the course and competitors. 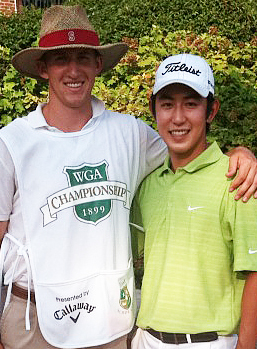 With his teammate Wilson Bowen caddying, rising junior David Chung wins the Western Amateur at Skokie CC in Glencoe, Illinois. 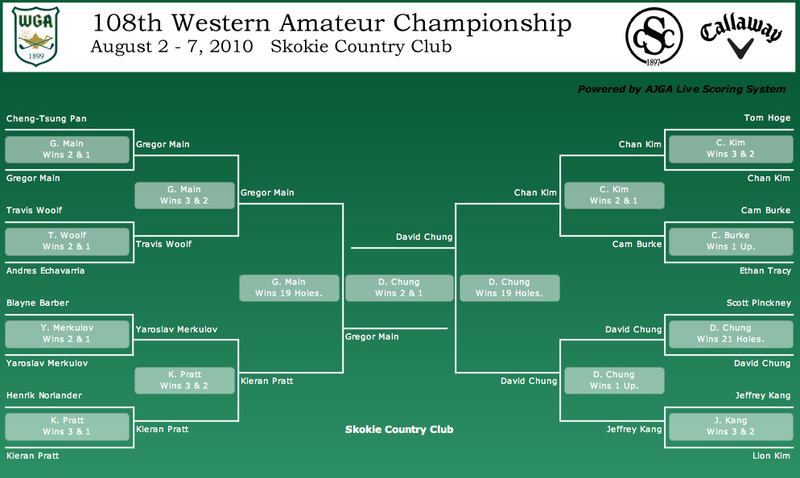 The Western Amateur is considered the 2nd most important amateur championship in the US behind only the US Amateur, knocking off 4 Pac-10 golfers in the process. 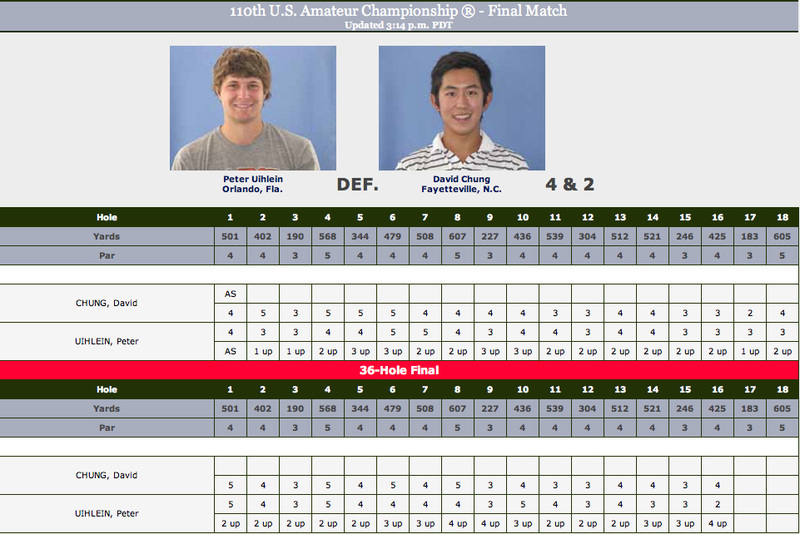 This impressive win comes one week after David won the Porter Cup in NY, probably the 3rd most important amateur event. Past champions of the Western Amateur have included Tiger Woods, Justin Leonard, Phil Mickelson, Hal Sutton, Curtis Strange, Ben Crenshaw, Andy North and Lanny Wadkins -- all major championship winners. 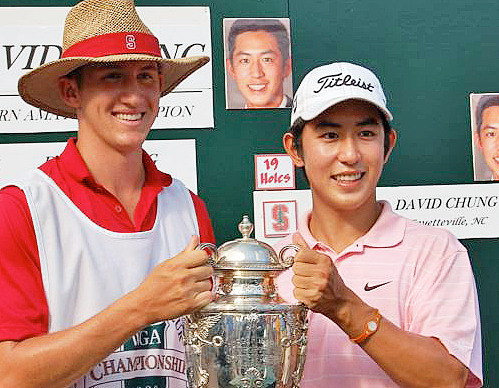 With this win David will jump to #2 in the world amateur rankings maintained by Golf Week. His Stanford teammates Andrew Yun (#18), Sihwan Kim (#36), Steve Ziegler (#69) and Cameron Wilson (#118) are all in the rankings as well. 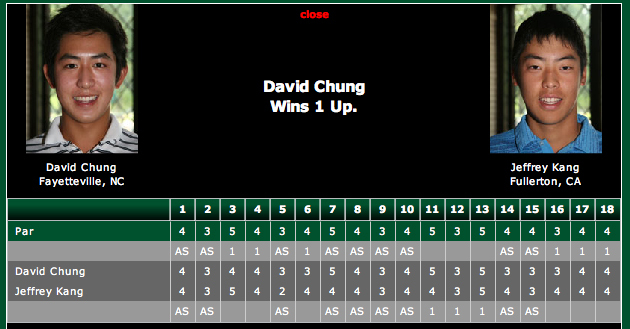 In the finals David beat UCLA junior Gregor Main 2 & 1 on the strength of a 5-under round capped off by birdies on the 14th and 15th holes. To reach the afternoon finals he beat former ASU player Chan Kim, who will turn pro soon, in the semis on the 19th hole in the morning in a round with 5 birdies. came back from two holes down early in the final match, birdieing five of his first six holes on the back nine. 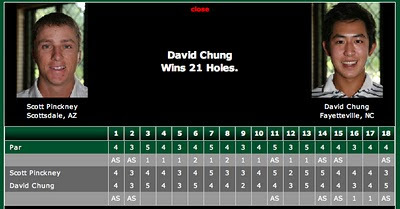 Chung, who uses a long putter, was playing so well that when Main reeled off three consecutive birdies on holes 11, 12, and 13, he picked up only one hole, and the match remained tied as the two players walked to the 448-yard par 4 14th. “Making birdie on 11, 12, and 13 and only getting one back there was tough,” Main said. On the 14th, Chung drained a 20-foot uphill putt for birdie while Main’s tee shot hit a tree and dropped down into a fairway bunker 195 yards from the green. Though he hit the green from the bunker, Main had little chance to hole his cross-country 60-foot birdie putt – and didn’t. Advantage, Chung. On the driveable par 4, 325-yard 15th, Main’s tee shot just missed hitting the flagstick by inches and wound up just over the green in the rough. 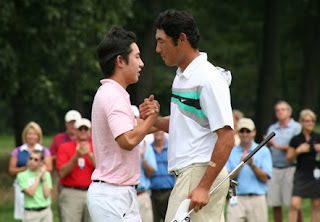 Meanwhile, Chung smiled and high-fived his caddie and Stanford teammate Wilson Bowen of nearby Winnetka, Ill., after they watched his high-draw tee shot fly the pin and end up on the green some 40 feet past the hole. Main’s eagle chip from the rough slid six feet past the hole and he missed the come-backer that would have given him another much-needed birdie. 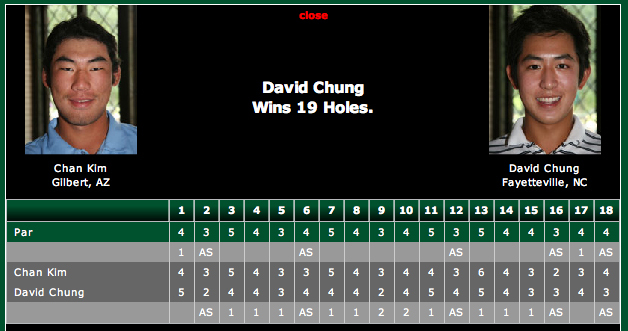 Chung lagged his first putt to just over two feet and calmly made birdie to go 2-up with three holes to play. Both players bogeyed the par 3 250-yard 16th, where Main drove into the greenside bunker and Chung three-putted; still Chung was dormie. Chung closed out the match on the par 4 454-yard 17th, when he got up and down from the right greenside bunker, making a 4-foot par putt while Main missed the 30-footer for birdie he needed to win the hole and extend the match. Chung won 2 and 1. On Friday, Chung got up-and-down from the same bunker to save par against Jeffrey Kang before winning the match on the 18th hole. “I knew I could get that up-and-down on 17,” Chung said. Here's an excellent article by Golf Week about the event and David's win. 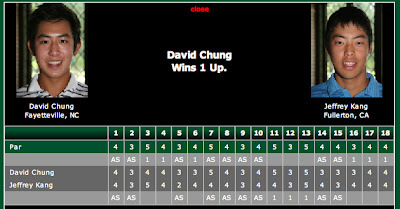 The day before David beat USC incoming freshman Jeffrey Kang 1-up and in the afternoon match beat ASU senior Scott Pinckney in 21 holes. Five other Stanford players competed in the event. The tournament format was medal play with a cut to the low 44 & ties after 2 rounds and to the low 16 after 3 rounds leading to match play. David advance to match play with rounds of 69-72-72 to tie for 14th. Andrew Yun shot 76-67-74 to finish T29, Steve Ziegler shot 71-74-75 to T40, Cameron Wilson had 74-70-77 to T46, Sihwan Kim had 69-78 to miss the cut (Sihwan stayed to caddie for David in the 3rd round of stroke play), and Wilson Bowen shot 77-73 and missed the cut as well. Wilson, an Illinois native, stayed and caddied for David after missing the cut -- on a personal note Wilson's mother Margot grew up playing at the host Skokie CC as her parents were members. Chung spent his day battling tough Pac 10 foes, winning in 21 holes over Arizona State senior and 3rd seeded Scott Pinckney in the morning and 1-up over incoming USC freshman Jeffrey Kang in the afternoon. “I just played the best round of golf I’ve played all summer,” said Chung shortly after shooting a 4-under 67 (including conceded putts) against Kang, who made the only bogey of the match. 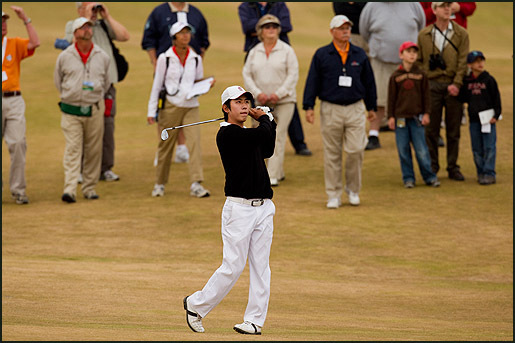 Chung used his extra-long putter and extra-long driving ability to edge Kang. Chung said he rode the confidence he gained by holing a five-foot par putt on No. 13 to roll in a 10-foot birdie putt on No. 14, a 12-foot birdie on 15, and an 8-foot par-saving putt on 17. It was on the 250-yard par 3 16th where Kang, who played solidly all day, made his only mistake. After hitting 3-wood from the tee to the right center of the green, his uphill 30-foot putt lipped out and spun five feet past the hole, leaving him with a tricky downhill-sidehill putt for par. Kang lipped it out and made bogey, the only one of the match by either player. Meanwhile, Chung drew an 18-degree hybrid to 35 feet directly below a left-rear pin placement and knocked his first putt to an inch and parred.